Ronni West's Happy-At-Home Cat Sitting is a pet sitting service that specializes in feline care and provides cats with the highest quality of loving care in the comfort and security of their own home. -A CATS ONLY service - visiting cats is all we do! -Over 40 YEARS EXPERIENCE in pet care. -Pet sitting VISITS PROVIDED BY OWNERS (not by employees or sub-contractors). -FULLY INSURED and trained in Pet First Aid. 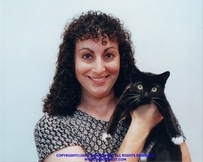 ​ Serving pet parents since 1998! As life long pet care providers, We understand that your cats are treasured family members who deserve the very best in pet sitting services. Our daily visits will provide exceptional service, deliver peace of mind, and priceless relief for you when you personally cannot be there. Our high standards ensure your cats receive the finest in home care services. ​Ronni West's Happy-At-Home Cat Sitting will help you find the PURRfect solution to your cat care needs and make sure your cats are HAPPY-AT-HOME!